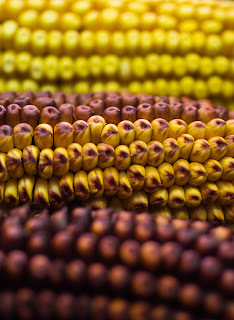 Professor Surinder Chopra at Penn Sate solved a nearly 6-decade-old corn gene mystery. It was discovered that a spontaneous mutant gene was responsible for red pigments seen on corn plant tissues. These included the kernels, cobs, tassels, silk and the stalks. This mutation would be observed for a few generations, and then disappear. Professor Chopra led the research into the mutant gene, named Ufo1 for Unstable factor for orange1, and using RNA-sequencing techniques and gene-cloning tools, came to the conclusion that the Ufo1 mutant gene is not the pigment causing gene in the corn. It was discovered that the p1 gene (pericarp color1) would be signaled by a transposon that the plant was under stress, even when stress did not exist. This would turn on the Ufo1 gene and the p1 gene, and ultimately the plant would be signaled to produce red pigments. Even though maize genetics have been studied for over a century, it is still important to know as much as we can about them. Understanding plant stress is vital to learn how crops adapt to climate change . I personally think that even though the research did not fully understand how Ufo1 and p1 gene interact, we are one step closer to understanding plant stress and growth. This research could not only help plant breeders and farmers, but crop protection and biofuel production.